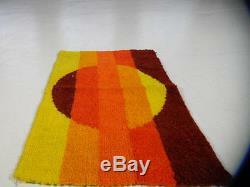 MID CENTURY MODERN SCANDINAVIAN VINTAGE RYA SHAG RUG. For more pictures please visit us on the web at campbellsloft. COLOR:yellow-orange, red-orange, red, dark-red. CONDITION: clean, no holes, rips, tears, normal wear. CAMPBELL'S LOFT HAS THE WORLDWIDE LARGEST COLLECTION OF TRUE VINTAGE MID CENTURY DANISH MODERN RYA AND OP ART SHAG RUGS. ALSO CHECK OUT OUR WEBSITE CAMPBELLSLOFT. OUR RUGS ARE TRUE ONE OF A KIND VINTAGE FINDS. THOSE VINTAGE SHAG CARPETS ARE VERY DIFFICULT TO FIND IN GOOD CONDITION. WE ARE SEARCHING WORLDWIDE TO BRING YOU ONLY THE FINEST SURVIVORS OF THE MID CENTURY ERA. BEWARE OF RUGS CALLED'RYA' BUT MADE IN INDIA or CHINA. THOSE ARE CHEAP COPIES MADE FROM A COMPUTER IMAGE. MOST LIKELY YOU WILL SEE A COMPUTER PHOTO OF A VINTAGE RUG BUT NOT THE REAL ITEM. RYA RUGS WERE MADE IN DENMARK, NOT IN INDIA or CHINA. ALL OUR RUGS ARE FROM OUR PERSONAL COLLECTION. THEY ARE AT LEAST 30 YEARS OLD AND WILL SHOW SOME SIGN OF USE. ANY FLAWS WILL BE SHOWN IN PICTURES. RUGS HAVE NOT BEEN USED ON OUR FLOOR, BESIDES FOR TAKING PICTURES. OUR RUGS ARE STORED IN A CLIMATE CONTROLLED , DUST FREE & LIGHT FREE STORAGE. Tags: mid century rug, modern rug, eames era rug, panton era rug, 60s rug, 70s rug, vasarelly rug, op art rug, danish rug, rya rug, knoll era rug, runner rug, small rug, large rug, rug, shag rug, carpet, vintage rug, MID CENTURY MODERN ART, loft art, eames, panton, space age, 60's , 70's , 1960s, 1970s, danish carpet, danish vintage carpet, midcentury vintage carpet, vintage shag rug, vintage shag carpet, danish modern art, mid century modern art, mid century collectable, mad men decor, mad men rug, ranch decor, mid century ranch, modern minimalist decor, op art carpet, op art , pop art shag rug, vintage pop art, andy warhol, lichtenstein, sixties, seventies, fifties, retro shag carpet, contemporary modern, minimalist loft, factory loft, industrial vintage, modern art, mid-century art, mid century collection, minimalist architecture, modern interior, loft interior. The item "Mid Century Modern Danish Knoll Era Vintage 70s Loft Decor RYA Shag Rug" is in sale since Thursday, March 30, 2017. This item is in the category "Collectibles\Vintage, Retro, Mid-Century\1970s". The seller is "campbellsloft" and is located in CAMPBELLSLOFT / NYC . This item can be shipped worldwide.